Q: I know there are two brothers that play in the band. Can you talk about your musical history and how it formed brokencompass? A: It began somewhere in the 2006-2007 range, when John was in high school and Dave in middle school. We were both in different bands around that time, but we would still occasionally collaborate and record random ideas we would compose together using some freeware (the names of the songs were rather ridiculous). 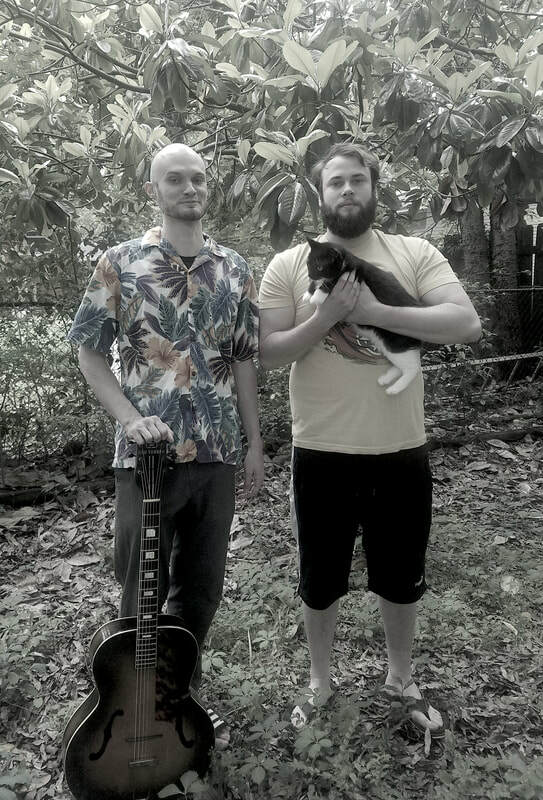 Around 2009, when John returned to Memphis from a stint in out-of-state college and Dave was then in high school, we formed a band together called One Wicked Dream and started recording our songs using Cubase. It took several years of musical growth before we started to develop what has become our current sound. In 2013, we spent a few days in our parents’ garage recording the drums and basic guitar tracks for what would eventually become Calm Before the Dawn. This was the true beginning of brokencompass, and it’s been an interesting journey from there. Q: Your album Calm Before the Dawn feels founded in indie and post rock? Can you talk about some of your influences musically and otherwise? A: John- Russian Circles and Cloudkicker are major influences, to be sure. I am also heavily influenced by the alternative sounds of the late ‘80s-‘90s, particularly the guitar stylings of J Mascis. I would have to say that the first time I heard the wild alternate tunings of Sonic Youth opened up a whole different perspective on songwriting for me. When it comes to instrumental music... And So I Watch You From Afar’s debut “Set Guitars to Kill” is without question one of my favorite records of all time, both for the music and its intense production. I’m a big fan of dynamics in music. As far as non-musical influences...the life and philosophy of Bruce Lee has been a longtime source of interest and inspiration for me. Dave- Russian Circles is definitely a big one. That sort of dynamic intensity is a major component of my own drum sound. I’m also a big fan of a lot of math-rock bands. Piglet’s Lava Land EP is a personal favorite record of mine, and I also incorporate a great deal from the styles of bands like Bulletproof Tiger and Fletcher. I find all of that sort of stuff really fun to listen to. ​Q: What type of reaction have you gotten from Calm Before the Dawn? A: People are appreciating the cohesiveness and unified concept elements of the EP. Several people have expressed the depth of emotions they’ve sensed in the music, and we’ve gotten comments like “this could be a soundtrack in an indie film,” and “this is some pretty great road trip music.” Gotta be honest here - the cinematic elements weren’t totally accidental, but that’s certainly not something specific we had in mind when working out these songs. It’s a pleasant surprise that the finished work is evoking these sorts of feelings in our listeners, and we’re super grateful for every person who has taken the time to give our EP a listen. Q: Although Calm Before the Dawn is instrumental can you delve into some of the concepts and themes you hope the audience might be engaged in? A: To us, it’s a musical journey. The transition pieces between the main bodies of music help to tie it all together and to tell the overall story. Where it all begins with the tension of the oncoming storm of “Elevators” is far from the place it ends with the resolution in front of the fireplace in “Dollhouse Mystery.” It’s a bit of Impressionism - telling a story and evoking moods through instrumental music...somewhat using the soundscapes to paint a picture without the direct references that lyrics bring to the table. If you watch the photo compilation video on our Youtube channel, you’ll see what we mean...there’s definitely a theme as to which photos were chosen for which moments in certain songs, but everyone who listens to Calm Before the Dawn seems to take it in a different way, which is the best part. We feel like the ambiguity of it is part of its charm as it allows each listener to feel their own responses and take their own respective journeys while listening through it all. Q: What the recording process like? A: We spent several days recording the drums and basic guitar tracks in our parents’ garage back in 2013 (and are grateful they were cool enough to let us utilize the space). Room sounds on the drum kit were a huge part of what we were going for with our drum sounds, so we chose the garage for its concrete floors and natural reverb. We did the entire process ourselves - John played the guitar and Dave played the drums, and John recorded everything to Pro Tools using two Profire2626s, allowing for sixteen live tracks total. It was nothing super fancy, nothing super expensive - just a utilization of the space and the equipment we had available to us at that time. Bass, additional guitars and keyboards were done as overdubs later on in the process, and John mixed everything on his home studio setup earlier this year. The whole process took a bit longer than originally planned due to moving around and some of life’s famous curveballs, but we’re happy with the end result and glad things are where they are today. Q: What else should we know about brokencompass? ​A: We make music we like to listen to, and the DIY principle is a huge element of what makes brokencompass. We plan to continue to record and produce all our own stuff for now because we enjoy doing it this way. We are currently in the process of recording new music (probably for release this fall/early winter), and it’s going to open up the sound a bit more while still featuring the core elements. There are also plans in the works to play a couple of live shows around Memphis later this year once we have more material from which to choose our set. As far as the next record goes, there will be some collaborations with musicians we know and whose work we enjoy around our local area, so that’s going to be interesting. There may even be one or two songs featuring a vocalist. The extremes are going to get more extreme - there will be songs that are heavier than anything we’ve done yet, and there will be songs that are more ambient than anything we’ve done yet. It’s going to be fun. Calm Before the Dawn is only the start of the journey - brokencompass has only just begun, and the best is yet to come.